Streaming Analytics for Financial Services: Why it’s Important? Financial services firms are constantly striving to deliver the best possible customer service to increase loyalty, reduce churn and generate more revenue while mitigating risk. There is no shortage of information about their customers’ interactions. However, this information tends to remain fragmented across a variety of platforms making it difficult for financial institutions to quickly extract intelligence that can positively impact a customer’s real-time experience. The reality is that their customers now have an incredibly diverse range of financial product and service choices that are, very often, just a click away. And financial firms typically have less than a minute to influence their customers’ decisions and perceptions. How can a firm analyze and act on information in seconds to react to issues that affect customer service, or respond to opportunities that improve their experience and in turn, contribute to the bottom-line? With expanded customer interaction channels, the avenues for fraud have multiplied exponentially. Fraud patterns continuously evolve making it extremely difficult to pinpoint and proactively prevent such behavior. The challenge that most financial institutions face is to quickly ingest, correlate, analyze and act on the insights uncovered from massive volumes of rich and disparate data streaming in from a multitude of sources so that they can engage their customers more effectively, identify new business opportunities and proactively prevent fraud. Traditional business intelligence (BI) and data warehousing approaches that rely on persisting data and bulk analysis introduces far too much latency to be able to deliver insights in a timely manner. That’s where Vitria’s Operational Intelligence (OI) solution can help. Vitria Operational Intelligence (OI) uses an event-driven architecture to tackle streaming Big Data, delivering real-time analytics that can help detect customer-affecting issues, even before they happen. Examples of data sources that it can tap into include data that resides in traditional data warehouses and other batch-oriented Big Data Analytics stores as well as live streaming data including Web application data and IP address data, location-based data, device data, customer profile data, demographic data, billing data, usage data, as well as social media data. 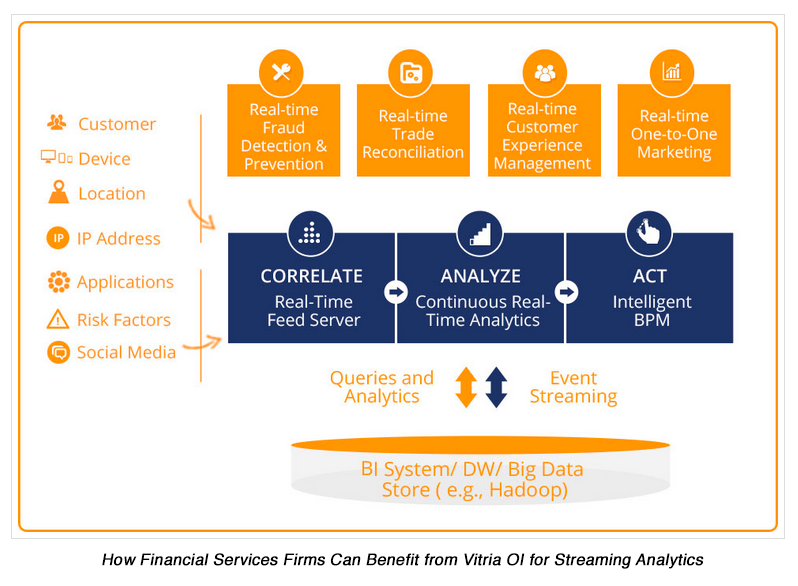 By correlating and analyzing these streams of data, Vitria OI provides financial services firms with continuous, real-time operational intelligence that puts them in a better position to improve their customers’ experience, engage in real-time one-to-one marketing to cross-sell and up-sell the right offers at the right time, and proactively detect and prevent fraud. It helps financial institutions connect the dots by tracing live transactions and business activity across interaction channels, systems and organizational silos. It can immediately alert teams to issues and trends that might impact a customer’s experience, ideally before the customer becomes aware of them thereby preventing customer dissatisfaction and churn. Vitria OI is the only unified software platform designed to provide financial institutions with continuous insight into the current state of their business by analyzing and immediately acting on streaming, real-time information.